A side benefit of taking foundry at BCCC is being able to do a small personal project even in my first semester. The positive is composed of Victory Brown sculpting wax in sheets pressed around the end of my wooden scabbard core, with additional lumps acting as filler. The whole is scraped and rubbed smooth; detail is then applied by rolling tiny pieces of wax and squashing them onto the surface. Gating was indirect and complicated. I attached one vent to the inside of the front because I didn't want to mess up the design on the outside. Dipping, firing and pouring proceeded smoothly. Divestment was a bit delicate, however, for obvious reasons. 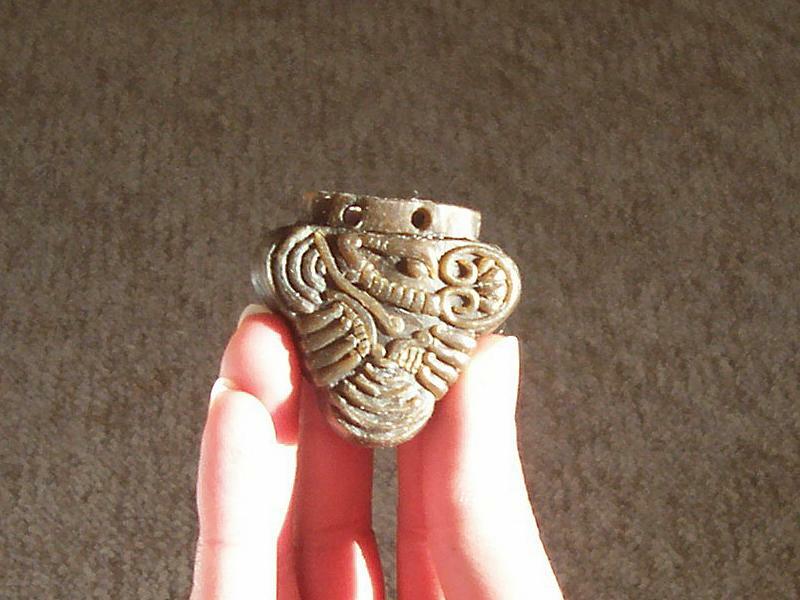 About eight pounds of bronze were poured to make a casting of less than two ounces. I had to tediously wear off all the stubs with carbide-edged die grinder attachments. It was during the fitting process that I began to regret having put a gate on the inside. In the end I even sanded down the scabbard core a little in desperation - a loose fit will be necessary because the scabbard is to be covered in leather. Since these chapes are usually found with the holes at the top empty, I speculate that they were held in place with organic pins, probably wood. Divesting had to be continued on the inside entirely through sandblasting so as not to deform the walls with hammer blows. The finished chape, after sanding with 400- and 1500-grit paper and burnishing with a steel wire Dremel brush. I intend to create a permanent rubber mold from it before applying a finish of clear wax and attaching it to the scabbard. * Less than FOUR ounces... just under three and a half, specifically.